La Sportiva has long been known in the U.S. endurance-running world for their footwear, particularly their burly mountain-running shoes capable of tackling anything. Undoubtedly, they’ve been far better known in Europe with their long-time presence in mountain running and ski mountaineering. 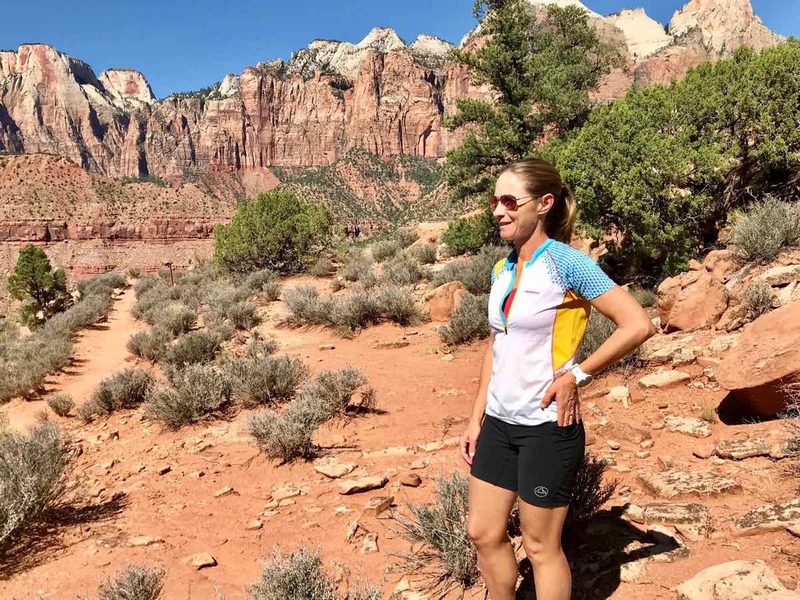 Thanks to the visibility of their mountain-running teams on the national and international stages, I became more aware of their apparel options over the past few years. I was excited when La Sportiva generously sent me a few items from their women’s line awhile back, and I’ve been too busy wearing them to actually write a review. What follows is literally a year’s worth of ‘testing’ of what I obviously really, really enjoy wearing. 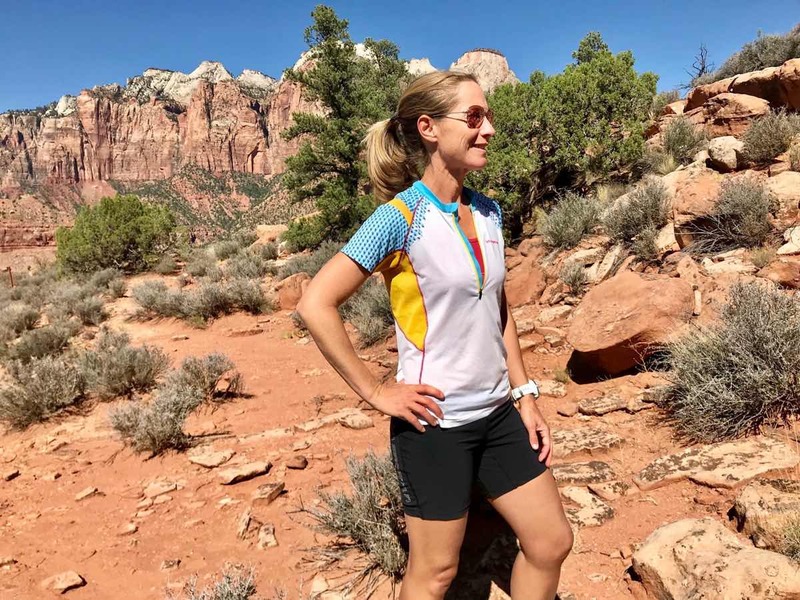 The La Sportiva Speed T-Shirt ($79) is my favorite hot-weather top after this past summer—we had many 90-plus-Fahrenheit-degree days to test my preferences this year. It’s closer fitting than I usually prefer yet it never feels tight. 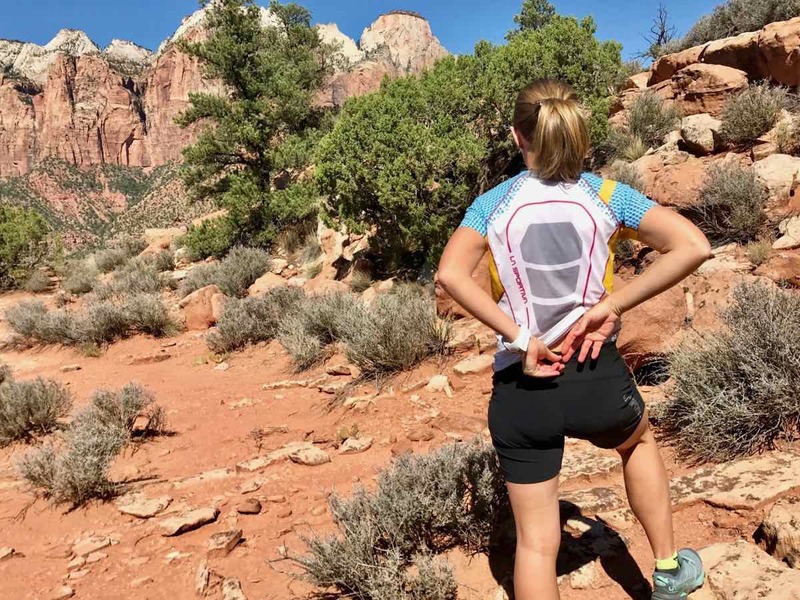 The mostly polyester HeiQ Adaptive Ventilation fabric is body-mapped and is truly excellent at moisture management and breathability such that it glides over my skin without ever sticking or feeling clammy even under a pack. If you hold it up to the light, you can literally see through the shirt which helps explain the scant 2.9-ounce weight, yet on your body, it’s perfectly modest. The front half zip (zipper garage included at the neck) facilitates just the right amount of airflow while maintaining coverage, and the higher neck protects your skin from the sun as well as any irritation your pack might cause. The fabric under the raglan sleeves is a larger-pore mesh for increased air flow but is so soft that chafing was never an issue. The fit tapers slightly toward the waist, so the shirt never rides up under a pack nor does it billow in the wind. As autumn has settled in, I’m finding that it is a perfect under layer when the weather cools and you need to add a mid- or outer layer. Size-wise, I followed the measurement guide and ordered the small, which is perfect. The sublimated print artwork of the Speed T-Shirt is an interesting change from the usual monochromatic look many running shirts use. With the reflective hits on the lower sides and in several large patches down the back, it’s definitely flashier than I typically choose, but the technical material and fit really make it stand out above the rest. Thus, it’s my favorite running shirt for warmer temperatures. Note, the newest version of this shirt has one handy side pocket included for key or gel storage. 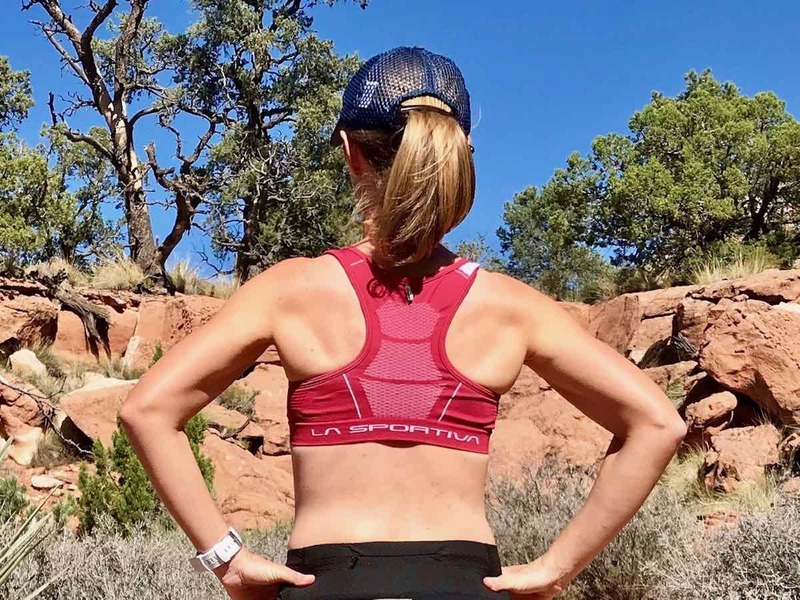 The La Sportiva Aurora Sports Bra ($45) is exactly the type of sports bra I prefer wearing—a simple, stretchy, seamless, pull-on-over-your-head ‘smasher’ bra. As someone who doesn’t have much to support up top (A-cup), this is my dream bra. It’s highly breathable, super soft to the touch, and has literally no bells and whistles or awkward ‘modesty pads’ whatsoever—yay! It’s stretchy enough that, whereas I’m usually always in a size medium bra due to my rib-cage size, I went with their measurements and ordered the small, which fits perfectly. What the bra lacks in ‘features,’ it makes up for in the technical fabric (soft Be-Cool yarn and 3-D mesh back insert for extra ventilation) and a complete lack of chafing ever. If you don’t have need for significant support from your sports bra, get one in each of the two colors offered—berry and blue moon. A front view of the La Sportiva Aurora Sports Bra. La Sportiva Aurora Sports Bra back view. The La Sportiva Waft Tight Short ($65) looks like fairly standard seven-inch compression shorts, except surprisingly they offer no compression at all. Instead, these are ‘fitted’ shorts made from polyamide and spandex with four-way stretch and a UPF 50 rating, which means no chafing and ample protection from abrasion/elements, such as when wedging a hip or thigh against sandstone is part of the run. There are sleek, integrated pockets for gels or small bars on the lateral thighs and a zip pocket in the back. The grippy strip at the waist and thighs enable the shorts to stay put even if you hitch the shorts up or push the waist down as you sprint, saunter, and scramble through your run. I also loved the fact that the toggle that adjusts the waist drawstring faces out rather than digging into my stomach. At first I wished for compression every time I wore them, but now, I just appreciate them for what they are—snug-fitting longer shorts for when breezy thighs aren’t preferred or desired. I love them and wear them in all types of weather, but I really like them on warmer days when compressive material might feel a bit oppressive. They also ride nicely under a skirt if you need non-compressive ‘briefs’ for that purpose. Again, I followed their size chart and chose the medium, which was right on in fit. The reviewer showing one of the lateral hip pockets on the La Sportiva Waft Tight Short. La Sportiva Waft Tight Short back view. This was my first time wearing any La Sportiva apparel and I’m duly impressed. I have no doubt I’ll be wearing these until they’re threadbare which, judging by how well they’re holding up thus far, is going to be a long time. The Polygiene anti-odor/anti-bacterial treatment has also kept the garments free of any odors even when I’ve worn them multiple times before washes. That’s significant—I’m sure you agree. It’s harder to get ahold of these items in local stores, but I’m very comfortable ordering online because their size chart for me held true on all three items—in other words, the garments run ‘true to size’ as determined by my measurements against their size chart. I’ve worn the three pieces in hot weather in Arizona and Colorado, in the fifties Fahrenheit on high mountain ridges, and under full waterproof layers as well as with mid-layers added in and have been really happy with their function and comfort in every situation. The sports bra is the first one I pick on the hottest days but also for pilates or under a tank dress when another layer is needed. Overall, I’m excited to try more pieces from La Sportiva’s running line—they really do appear to have their women’s audience in mind for highly technical performance apparel. Have you worn any of these three pieces of women’s clothing? If so, can you share your thoughts on them? And how about other items in La Sportiva’s running line? Can you share your thoughts on those pieces of clothing? Men, be sure to share your thoughts on men’s La Sportiva running clothes, too.